Did You Get My Postcard Mom? I’m late with my ds106 design stuff, but you will not catch me saying I am sorry. I did assemble this for the Postcards from Magical Places assignment, which we had our UMW students with a requirement that the image come from Minecraft. 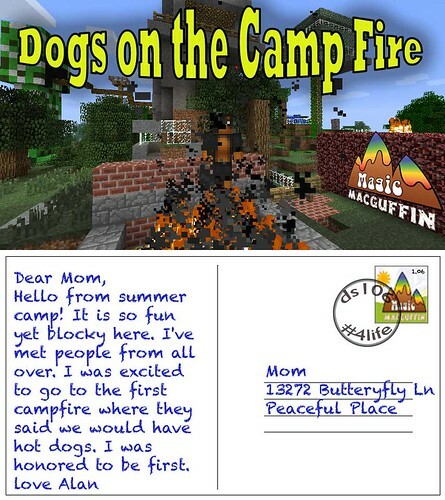 The fornt should use graphic design elements that provide a sense of place or use the classic motifs of old postcards (“Greetings from ______”)_, both pictures and text. The back of the post card should contain a stamp and postmark that fits with the theme of the movie, as well as an addressee and a message that fits the plot as well. During our first camp fire hangout in Minecraft, I played with putting my new dog skin in the fire, and this seemed to work well as a camp prank of hot dogs. I started out in GIMP but got frustrated with the inability to do some effects on text, and with a loaned copy of PhotoShop, I did this image with rather simple edits, some text warp for the post mark.